Too many women are taking an opioid like Vicodin or Oxycontin before they know they're pregnant, doubling the risk of birth defects. Here's how to stay safe. When you hear about people seeking prescriptions for drugs like oxycodone, morphine or codeine, the image of a pregnant woman doesn't normally spring to mind. But a new U.S. Centers for Disease Control and Prevention (CDC) report reveals that every year, more than a quarter of reproductive-aged women with private insurance, and more than one-third of those enrolled in Medicaid, fill a prescription for opioid pain medication. Imagine hanging out with three pregnant buddies – that means at least one of you were, knowingly or not, taking a heavy-duty pain medication drug like Oxycontin or Vicodin. 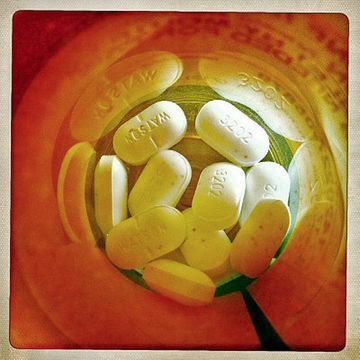 Opioids have their place – these powerful drugs can bring much-needed relief to patients suffering severe pain from injury, dental surgery or severe headaches. But if taken early in pregnancy, they can double the risk of birth defects of the baby's heart, brain and spine; used throughout a pregnancy, they can spark preterm labor as well as heartbreaking newborn withdrawal symptoms. No one is suggesting that OB/gyns are knowingly doling out Oxy prescriptions to moms-to-be at their first trimester ultrasound screening. The major concern is that women might be ingesting these medications without realizing they are pregnant. As the CDC points out, half of all pregnancies are unplanned, so women may be prescribed an opioid-based pain medication before they – or their health care provider – knows they have conceived. In light of that scary possibility, pediatrician and March of Dimes Board of Trustees member José F. Cordero, MD, MPH, strongly urged opioid pain killer users to be diligent when it comes to birth control. Then, "If you decide to get pregnant or do become pregnant, tell your health care provider about all the medications you are taking right away," Cordero said in a CDC press release. "You may be able to switch to a safer alternative." Read the label Opioids can be found in certain prescription cough medications; avoid anything with the words "promethazine-codeine" in it if you're between the ages of 15 and 44 and not on birth control. Consider your location CDC data found that private insurance opioid prescription rates were highest among women in the South and lowest in the Northeast. Your ethnicity might be a factor Opioid prescriptions were nearly 1.5 times higher among non-Hispanic white women on Medicaid versus non-Hispanic black or Hispanic women. Alternatives exist Physical therapy can help alleviate pain, as can heat or massage.